One of the recommendations of a Technical Advisory Mission in 2010 was for the National Emergency Commission (CNE) to establish an inter-institutional group that focuses on the processing of satellite imagery to generate space-based information for disaster-risk management and disaster response efforts. 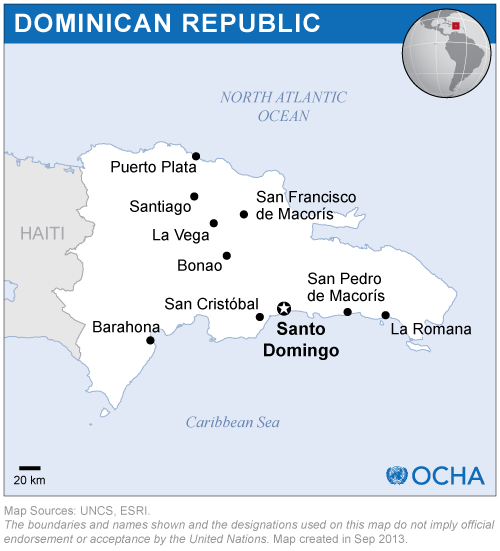 As a way to contribute to the implementation of this recommendation, UN-SPIDER carried out a follow-up mission from 7-11 November 2011. The mission took place under the coordination of CNE, serving as Secretariat to the National System for Prevention, Mitigation and Disaster Response, with the support of experts from CATHALAC and IGAC in their role as Regional Support Offices to UN-SPIDER. This mission included an inter-institutional workshop to elaborate the operational framework for the Geo-Spatial Information Team which will target efforts in the areas of risk management and disaster response. Additionally, meetings with representatives from government agencies, the United Nations, the European Union, and the International Cooperation Agency of Spain were arranged. The three-day workshop took place in the facilities of the Commission and gathered technical staff from the National Emergency Operations Centre (EOC), Civil Defense, Ministries of Foreign Affairs, Environment, Agriculture, Mining, and Health; the National Institutes of Water Resources, Statistics, and Military Cartography; the National Meteorological Office, the Institutes of Geography and Seismology of the Autonomous University of Santo Domingo, the Technological Institute of the Americas, and the Red Cross. The workshop participants recommended to the National Emergency Commission the establishment of the Geo-Spatial Information Team (EIGEO) as a structure for all of these institutions to work together in a coordinated fashion. The team will focus on the generation of space-based information to be used by the Technical Committee of the CNE, the Emergency Operations Center (COE), and other ministries in their efforts to respond to a variety of events which can trigger disasters, and in areas related to prevention, mitigation, and early warning. In addition, participants recommended the establishment of a coordination group integrated by representatives from the EOC, the Military Cartographic Institute (ICM), Ministry of Environment and the National Institute for Water Resources (INDRHI) which could oversee all activities conducted by the team and could serve as a liaison with UN-SPIDER, CATHALAC, and other regional and international organizations. The participants concluded the workshop with an outline of short-, medium-, and long-term activities to be carried out by the team, some of which will set the bases for further work. This set of activities constitutes already a Plan of Work which will guide the work of the team in years to come. Using this opportunity, CATHALAC donated to government institutions participating in this workshop the most recent radar satellite image mosaic of the Dominican Republic, which was acquired by CATHALAC recently. 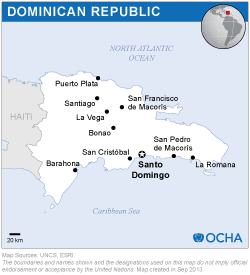 A training course on remote sensing applications to disaster-risk management and emergency response to be conducted in the Dominican Republic in the summer of 2012.